In the episode, The Fugitives, Serena is wearing a very intricate and unique sweater – you see the cut-outs too, right?! Here is Serena’s tribal-inspired IRO Abstract Floral Skirt. We see Serena in the episode Raiders of the Lost Art, sporting a fun and bright scarf. I really love how it starts really pops against the rest of her dark outfit. Serena wears these Repetto ZiZi Oxford Flats ($285). 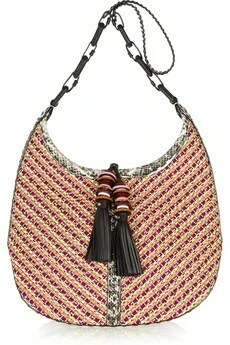 Here is her Jimmy Choo Lara Woven Shoulder Bag ($2150). She is also holding the Marc by Marc Jacobs Dreamy Logo Laptop Case ($68). This is her Theodora & Callum Orange Multi Diamonds Scarf. I really love the look of Serena’s jacket from the episode Despicable B. It’s a real step up from her usual all-black trench coats. It adds a much needed pop of colour using an appealing ombre effect. Serena wears the Kaelen Ombre Jacket ($499.27 CA). Her boots are the Ecco Hobart Buckle 25 MM Boots. Finally, she is carrying the Yves Saint Laurent Cabas Chyc Medium Extra-Wide Tote Bag (1,875 CAD). Serena wears this Missoni Metallic Knit Skirt. Serena’s LBD in the episode It Girl, Interrupted looks eerily similar to the one she wore from last week’s episode of Gossip Girl. That being said, this dress is only a fraction of the Porter Grey dress she wore last time! This is Serena’s Zara Jacquard Dress. On this week’s episode of Gossip Girl, It Girl Interrupted, our Upper East Side It girl pears a leopard print sweater with a beautiful black and cream skirt. This is Serena’s Haute Hippie Beaded Silk-Chiffon Mini Skirt. This is her Diane von Furstenberg Zebra Harper Bag ($825). Finally, she is also wearing a Bounkit Necklace.